Whether you are the one saying, “I’ve always wanted to go to Ireland,” or if you are like me and can’t get enough of The Emerald Isle, just needing a good excuse to return, there’s a new game in town and it’s definitely worth exploring. New affordable flights from Norwegian Air have turned the Mid-Hudson Valley into a hub for European travel. Non-stop flights happening several times a week from Newburgh, NY to Dublin, Shannon, Belfast, Edinburgh and Bergen. Plenty of connecting domestic flights to get you to Newburgh for your hop over the pond. Depending on when you’d like to fly, the price tag can truly amazing, as little as $129 each way. Festivals, concerts, markets abound at all times of the year in Ireland, Britain and mainland Europe, and off-season travel affords you the opportunity to see the sights without the crowds and blistering heat. It’s a win-win because you will be saving so much precious time without the stress and confusion of the massive NYC airports, and you’ll saving some serious money to boot. Contrast the following two scenarios: in both summer 2016 and summer 2017 I traveled to Europe (flying first to Dublin and returning from there) with my two children. Last summer I booked the plane tickets three months in advance with another airline. I paid $900 per ticket. We left the house 6 hours before the flight took off to allow for traffic, long lines, and security etc. I paid $250 for a mini-van cab to take us and our luggage to JFK airport. Despite having an amazing holiday, by the time we got on the plane to begin it, we were exhausted, only to be on a red-eye and arrive dealing with jet-lag. This summer, I had three different friends offer to drive us to the airport (hey it’s only a half hour away!). Our flight was actually delayed three hours, but since the airport was close by, I wasn’t in transit yet when I received the handy text message about the delay. I basically got three extra hours at home to get ready. If it were a city airport, we would have been waiting another three hours at the gate. I booked these tickets two weeks prior to departure (in July- high season). My son’s and mine were $600 each round trip, and my daughter’s was discounted because she is under 12 (yes, you read that right)! I paid the extra charge to have the seats together so we could fly as a family. I did not opt in to the in-flight meal. So essentially the difference was $2700 versus $1800. The main perceivable differences were no food and no movies (see below). We arrived at Stewart International Airport and my friend parked close by. We waited under ten minutes on the line to check in and check my bag. Met a random friend who was boarding the same plane. We then waltzed maybe 60 paces to security, where we proceeded quickly upstairs to the gates. This whole process was very simple and stress-free. In 6 hours, we were on the shamrock shores. And on the return flight (which is typically an hour longer due to wind patterns), our pilot got us back 45 minutes earlier than scheduled. *The US Security Pre-Clearance means you need to build in some extra time when departing to the US from airports in the Republic of Ireland (so build more time in for the duty-free shopping), but it also means you literally grab your bag and go once on US soil. No customs processing in the USA because it’s already been done. For those needing to get to points north or south of Newburgh after landing, there are easy transfers to the Metro-North train lines at Beacon station, and luxury shuttle buses for $20 adult/ $10 child one way (single) are offered to and from Stewart to The Port Authority Bus Terminal in the heart of Manhattan, just 75 minutes away. Long-term parking at Stewart International is convenient and affordable at $10 per day. Planning a holiday with multiple ports? The ease and affordability of the Norwegian flights allow you to begin in Ireland and make your way further abroad. Although we’d be more than content to remain in Ireland, connecting flights from airlines like Ryan Air make flying almost anywhere in Europe or further a breeze. Or take a ferry to the continent or the UK and get your tickets for a speed train! Other current international destinations from SWF include Belfast in Northern Ireland (UK), Edinburgh, Scotland (UK), and Bergen, Norway with buzz about more possibly in the near future. Customs procedures between the USA and those countries would apply upon arrival at Stewart. Norwegian is also flying direct to European cities from TD Green Airport (PVD) outside Providence, Rhode Island, convenient to Boston without the complexities of flying out of a major city. Do some research, because the fares vary, and are often higher on the return flight. Look for specials from Newark Airport too, which includes more destinations and is still an easier trip than some other airports in our area. As with any new venture, there will need to be a few tweaks to make a truly seamless experience. When we fly again from Stewart, my plan will either be to eat a hearty meal right beforehand, or to purchase the in-flight meal. Despite the food service workers doing an excellent job, the café is not equipped well for two plane loads of hungry travelers, especially when flights are delayed. My recommendation is that if Stewart/ Norwegian wants a piece of the international travel market, an investment in at least one proper, sit-down restaurant in the airport needs to happen soon. Also, if you don’t purchase the in-flight meal, try to grab a bottle of water at the gate because it’s possible you will be offered none. Our experiences were different on the two planes. Realize going in that a budget airline might not have all the amenities you may be used to. There are some cartoons on small screens throughout the aircraft, but no headsets provided. There is wifi available, but we found it is not strong enough to stream movies reliably on-board. Advice? Bring a good book, download the latest season of your favorite show onto your device prior to traveling, and journal on the way home about all your awesome experiences and insights. In addition, our region stands to benefit from European travelers choosing to arrive here for holidays or business. Budget airfares abound to get travelers on connecting flights to Ireland or to Norwegian’s other departure cities. Then it’s just a few hours to Newburgh. Those tuned in can see the wheels turning to build on our rich, diverse heritage with collaborative projects of cultural exchange. 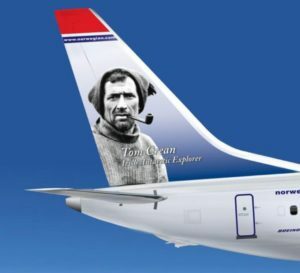 All things considered, Norwegian Air’s new endeavor is a true game changer and an exciting boon for tourism and travel in and out of the Hudson Valley, New York State, and the Northeast! Destinations Ireland and Beyond /The Destination Company has been a specialist in Irish travel experiences for over 28 years. Give our New York-based team your wish-list for a dream tour. We can tailor customized trips for teams, choirs, golfers, foodies, arts-lovers, bespoke wedding groups, and travelers of all sorts. We also offer expert air and transfer services. thedestinationcompany.com Find us on Instagram, Twitter, and Facebook. 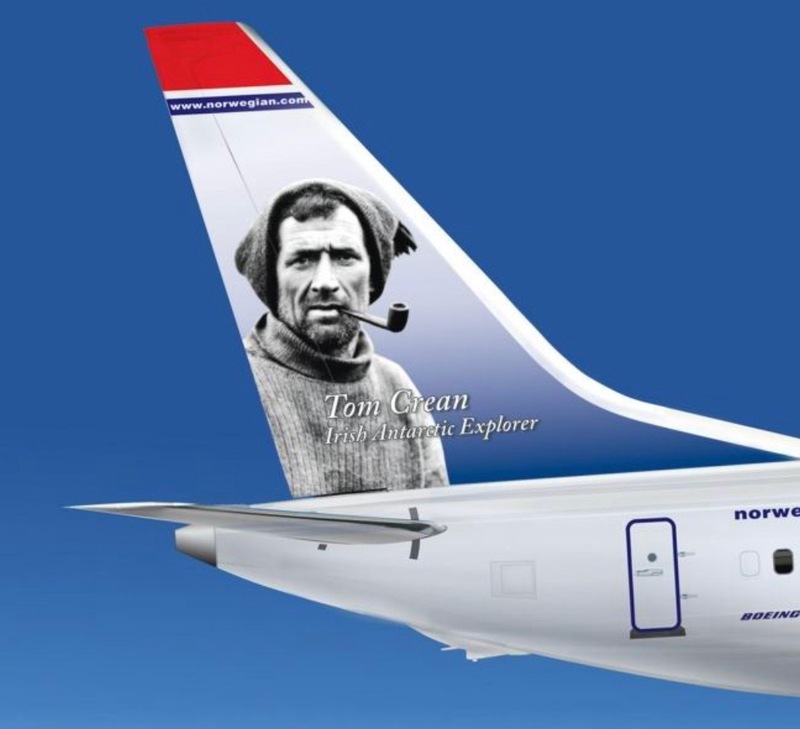 The first Irish Tail Fin Hero, Antarctic Explorer Tom Crean, part of Norwegian Air’s Tail Fin Hero Series honoring individuals demonstrating the spirit of innovation and perseverance. Crean has been recognized to mark Norwegian’s expanding destinations in Ireland.